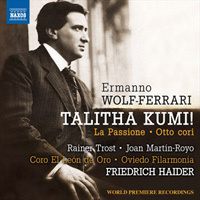 ERMANNO WOLF-FERRARI (1876-1948): Talitha Kumi! (Die Tochter des Jairus) for Soloists, Chorus and Orchestra, Op. 3, For a cappella Chorus: Otto cori, Op. 2, La Passione, Op. 21. Description: The main work here is the early “sacred mystery” of 1898, In two parts lasting 34 minutes, its title derived from an Aramaic quotation from Mark’s Gospel, the voice of an Evangelist carries the biblical narrative of Jesus bringing the daughter of Jairus back to life against a rich orchestral backdrop. Texts and translations available online. Rainer Trost (tenor), Joan Martín-Royo (baritone), Coro El León de Oro, Oviedo Filarmonía; Friedrich Haider.